I'm continuing on with my W.i.P. Wednesday posts, even though the link-up is closed until January. It just helps me keep track of progress! Wonderland Christmas tree skirt - I love how it turned out - non-traditional and all! If you'd like to see more pics, see here and here. Hollywood Boulevard table runner - The top is done! 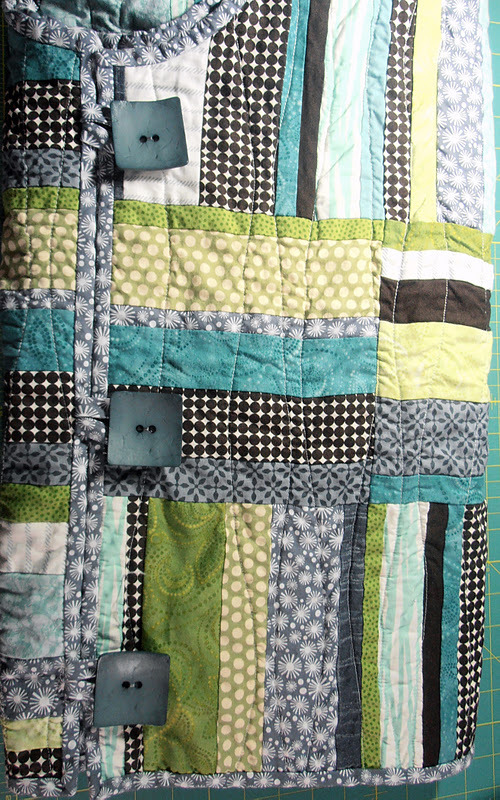 The pattern is by Atkinson Designs, and though the piecing was slow at first, once I got the blocks done, it went together (and nice!) in no time. 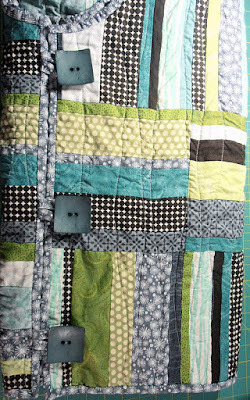 Wrenly hst quilt - no progress. Sad but true. * Placemats for Christmas gift - really need to get started on these! Alot got done this last week, but still some deadlines to meet! I love how the tree skirt looks like a quilted jacket with a neckline and the buttons down the front! I love it all, the table runner will be great! And a fun list of projects too. your tree skirt is perfect! i love the square buttons. that table runner is pretty cool, too. Love the tree skirt!! The buttons are a great touch! Everything is so pretty! Love your tree skirt. Those buttons are the perfect touch. I love seeing all your progress, Debbie. What is the fabric you used for the tree skirt? Is the table runner for you? I think it's so much fun when something comes together nicely, even if slow at first. Still hoping to win that mini! oh geez, thanks for the reminder about do.good stitches - first month and I'm already slacking! whoops hehe -- love that tree skirt!! Wow that table runner is fabulous, I love it! oh i love that table runner. i need one for my table!